Recorded in the spellings of Aird and Airds, this is a Scottish locational surname of considerable antiquity and history. It originates from either the village of Aird near Hurlford, in Ayrshire, or from the hamlet of Aird, in the parish of Inch, Wigtownshire. The meaning of the name is obscure, but it may be from the Olde English pre 5th century 'ad' meaning a funeral pyre, and presumably a place where such ceremonies took place. Another possiblity is from the word 'eyera', meaning a gravel bank. Most locational names derive from a meaning associated with a local landmark, and these in themselves were often quite insignificant, but not so to the small communities of ancient times. It is not certain as to when the surname was first recorded, although it is reported that the Airds of Holl, and the Airds of Catrine, both in Ayrshire, were ranked as 'old famillies' in the early 16th century. Amongst the first known recordings are those of two brothers Nicoll Aird and William Aird, arrested for murder in 1526, although later reprieved. They were followers of the Earl of Cassilis, who it is said was trying, unsuccessfully, to start a rebellion. 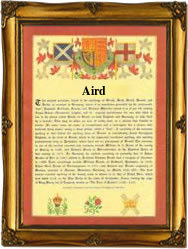 Other recordings taken from authentic rolls and charters of the period include: George Aird of Melrose in 1658, James Airds, the minister of Torryburn in 1686, whilst one William Aird was confirmed as the heir to the estate of (another) William Aird of Holl, in 1687, and far away in Dundee John Aird was recorded as being both a burgess and a maltman in that city in 1697.